Isolating valves are used either fully opened or fully closed, for the express purpose of isolating flow when necessary. In critical applications, these valves are often actuated by motors. Control and regulating valves are designed for use in a less-than-fully-opened configuration, to regulate the amount of flow through the pipeline without shutting it off completely. Gate valves, in particular, should never be used for this function unless the flow rate is very low, as the wear on the seating surfaces can cause these valves to leak when fully closed. Check valves are designed to permit flow in one direction only, preventing backwards flow in the pipeline. While most valve types can be used as either isolating valves or as control/regulating valves, check valves are uniquely designed for that specific purpose. Select the valve type by name below to see a more detailed description. * Not recommended for throttling purposes. ** Not designed to control normal operating pressure; only used to relieve excess pressure in case of system failure. Gate valves function by raising and lowering a flat plate (by manual hand wheel, pneumatic actuator, etc.) to clear or obstruct the the flow within a passageway (usually a pipeline) in a perpendicular fashion. Because these valves often rely on soft seats to provide a seal, using them for throttling or regulation purposes is not recommended, as this can wear down the seats and cause the valve to leak. The design of gate valves has not changed much over the past century. Commonly cast, but also forged or fabricated, these valves can range in size from 1/2" through 144", with larger applications including dams and waterworks projects. The flow path inside a globe valve is bifurcated: within the "globe"-shaped body of the valve, a divider separates the top (usually inlet) half and the bottom (usually outlet) half, with a hole through the center of that divider. 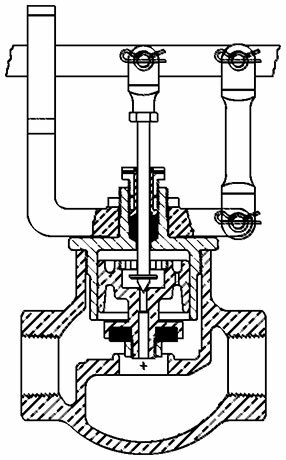 Turning the valve raises and lowers a plug-like device that sits in that hole on the topmost half of the globe, the inlet pressure (if configured as such) serving to hold it shut in addition to tension from the valve actuator. Globe valves are the most ubiquitous type of control valve by sheer percentage. Home faucets and outdoor spigots are typically globe valves. Ball valves utilize a machined ball (usually steel) as the flow-blocking mechanism. A hole is drilled through the ball to match the inner diameter of the surrounding inlet and outlet of the valve. 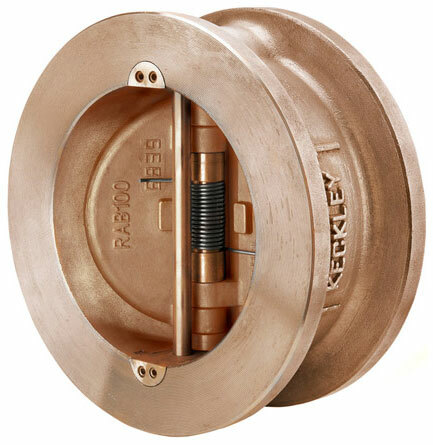 When turned 90 degrees by the valve handle, the hole no longer aligns with the valve inlet and outlet, shutting off the flow; varying degrees of openness can be used to throttle and regulate the flow. Ball valves can be made either with a metal or a Teflon seat, the latter kind referred to as floating ball valves. 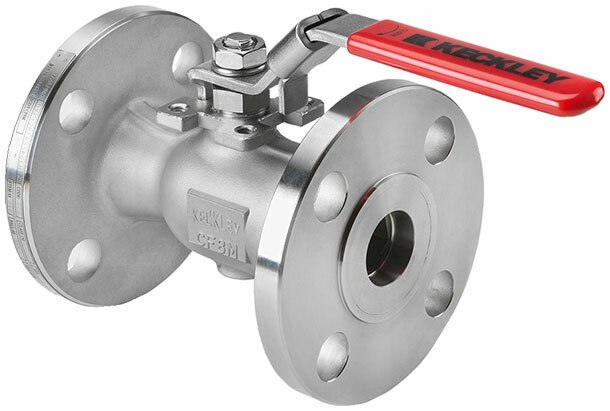 Floating ball valves are generally only made up to 12" in size, with a maximum working temperature that does not exceed 450°F. Note: Not a Keckley valve. 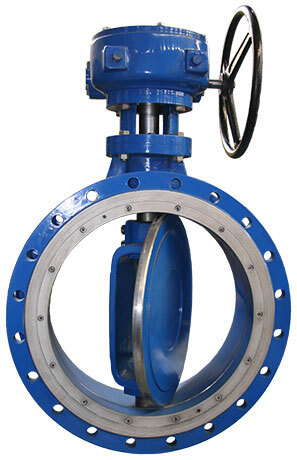 Butterfly valves rely on a center-hinged disc to allow or deny flow through a pipeline. The actuator turns the disc on its central hinge: when closed, the disc is perpendicular to the flow of the pipe, blocking the inner diameter of the line; when fully open, the disc is parallel to the flow, allowing minimal resistance. Varying degrees of openness can be used to throttle or regulate the flow. 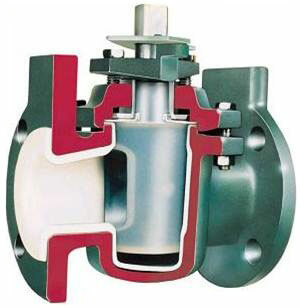 Similar in principle to the ball valve but much older in design, the plug valve uses a tapered plug, nested within the body housing from above, to block flow through the pipeline. A cavity is machined through the center of the plug, from one side to the other, in a shape corresponding to the surrounding inlet and outlet ports. When open, these holes align, allowing flow; when closed, the plug is turned sideways, closing off its passage to the inlet and outlet. Plug valves come in lined or lubricated varieties, depending on the chemical needs of the application. However, many applications are better suited for ball or butterfly type valves. Though the exact designs and terminology vary from application to application, safety valves and pressure relief valves are designed to function only when something in the normal operating controls has failed, usually causing an unsafe build-up of pressure in the system. These valves are designed to open in order to safely bleed away the excess pressure, closing again when conditions return to normal. A safety relief valve on the tank of an air compressor, for example, would be designed to open somewhere between the maximum recommended (safe) pressure of the machine and the maximum rated pressure of the storage tank, preventing the likelihood of tank rupture. Check valves come in many different forms, but they all serve a singular purpose: to allow flow in one direction but not the other. A double disc type check valve (pictured), for example, uses a pair of internal semicircular discs with spring tension to accomplish this. In one direction, a minimum amount of flow overcomes the spring tension to swing the discs open like doors, allowing the flow through; if that flow ceases, however, or reverses, the springs close the discs against the valve seat (hard or soft) and the pressure of the back-flow prevents the valve from opening again. Silent type center-guided check valves utilize a similar concept: a whole disc is held against the seat by a spring until overcome from the inlet side by enough pressure; a drop in pressure and/or back-flow from the outlet end of the valve closes the disc against the seat. The human cardiovascular system has many organic check valves in its veins, preventing the back-flow of deoxygenated blood between heartbeats. Types: swing, piston, ball, double-disc, and "silent"
Keckley is a registered trademark of Keckley Company.